Global demand for air and fluid filters is forecast to rise 5.4 percent per year to $44.9 billion in 2020. Over 45 percent of new growth will occur in the Asia/Pacific region, with more than half of that attributable to China. Fluid filters will continue to account for the larger share of global air and fluid filter sales through 2020, with over 60 percent of total air and fluid filter demand eminating from the manufacturing and consumer markets in 2015. This report covers the scope, size, and growth of the global air and fluid filters market, including key trends in products and market segmentation. Historical data are provided for 2005, 2010, and 2015 with forecasts for 2020 and 2025. Data is provided in dollar value. Also included is an analysis of the key industry players and their market shares including Camfil, CLARCOR, Daikin, Danaher, Donaldson, Filtration Group, Parker-Hannifin, and 3M. 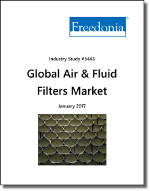 This study analyzes the global market for air and fluid filters. Supply and demand data are presented for sales of filters by product -- fluid (fluid power, consumer water, and other) and air (panel and pocket, fabric air pollution, and other) -- and by market (manufacturing, consumer, utilities, and other). Internal combustion engine and related filters (including oil, air intake, fuel, and cabin air filters, as well as smaller volume filters such as those that control emissions and treat transmission fluid, engine coolant, and brake fluid) and membranes are excluded from the scope of this study. Internal combustion engine and related filters are covered in Freedonia Group’s #3481 Global Internal Combustion Engine & Related Filters Market (January 2017) study. Historical data are provided on a country-by-country basis for 2005, 2010, and 2015, with forecasts provided for 2020 and 2025.